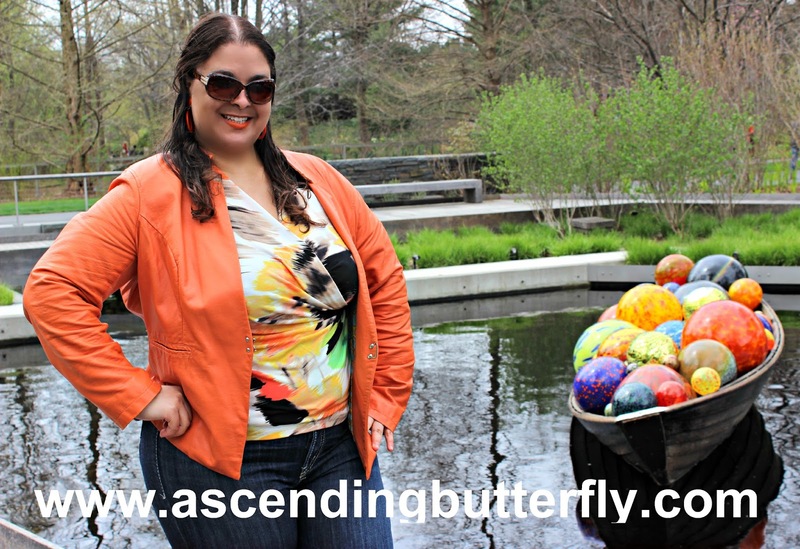 Ascending Butterfly: When your outfit inadvertently matches the art exhibit! #ChihulyNYBG + winner of our @NYBG #CHIHULYNIGHTS Giveaway Announced! 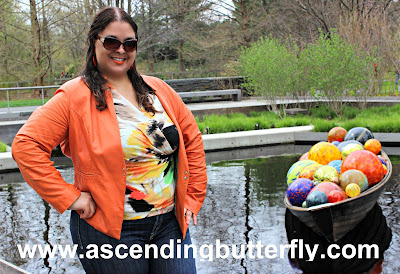 When your outfit inadvertently matches the art exhibit! #ChihulyNYBG + winner of our @NYBG #CHIHULYNIGHTS Giveaway Announced! Remember when I told you I took WAY too many pictures at the Media Day of the Preview of the Dale Chihuly Exhibit at Botanical Garden? Did I also mention I sort of inadvertently matched one of the installations in the exhibit? 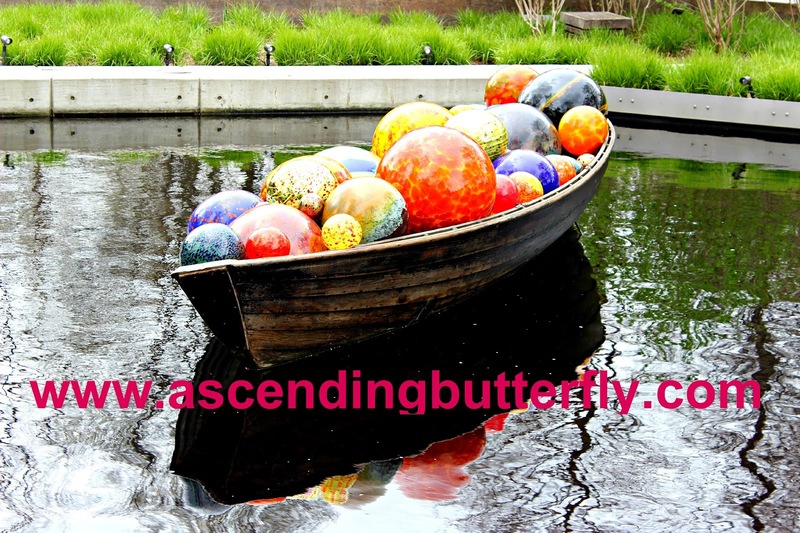 Above: I love that this boat just literally free floats, so the spheres catch different light and cast different shadows depending upon where the boat is when you photograph it. The day I was there it was super overcast, thankfully it didn't rain! 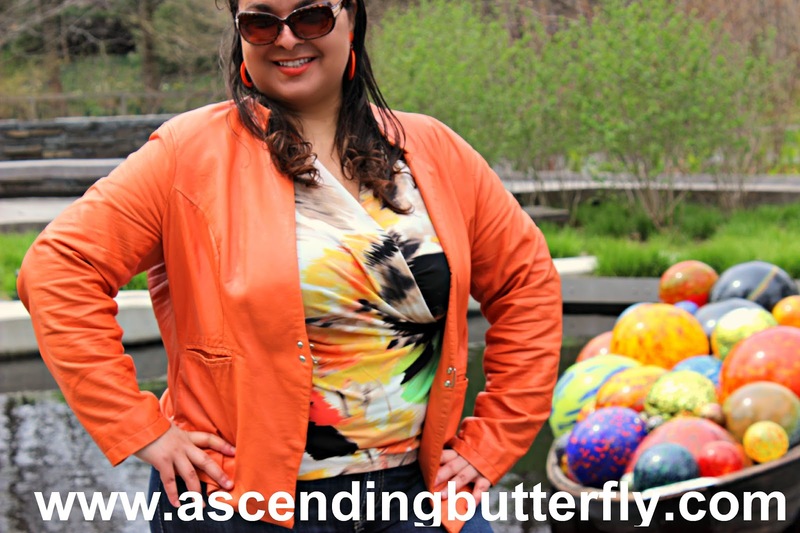 Above: These Butterfly picks were in the Gift Shop, and again they are kind of matching my outfit! Above: OK so I may have been a bit 'Orange' obsessed that day! 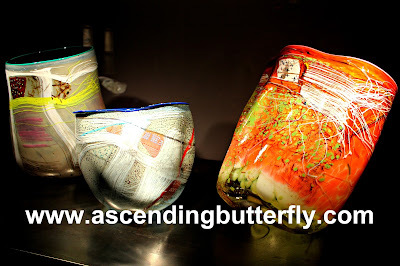 WINNER ANNOUNCEMENT: I know you all entered my giveaway for a set of passes to Chihuly Nights at Botanical Gardens right? (see giveaway post HERE) - well drumroll please because we have a winner, Congratulations to Laura F.
There are definitely way more photos, I'll break them up! If you haven't checked out the exhibit, what are you waiting for? Be sure to put the New York Botanical and this exhibit on your summer to do list! The New York Botanical Garden announces free admission for U.S. veterans to CHIHULY Nights on four select dates between Memorial Day and Labor Day. U.S. veterans of any military service branch will receive free admission to CHIHULY Nights on Saturdays, May 27 and June 24, and Thursdays, July 6 and August 31. 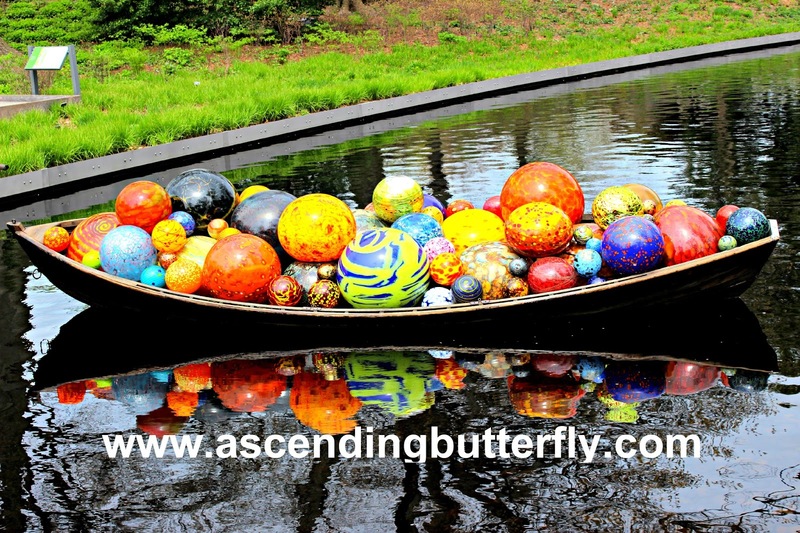 CHIHULY, the major new exhibition at The New York Botanical Garden, presented by Bank of America, features more than 20 installations by world-renowned artist Dale Chihuly. 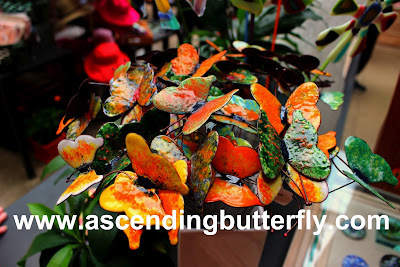 What are YOUR Memorial Day Weekend Plans Butterflies? FTC Disclosure: No monetary compensation has been received, and all opinions are 100% my own! 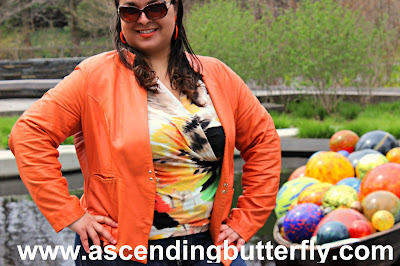 I covered the Media Day as press and the giveaway was sponsored by NYBG but NOT compensated. I am disclosing this in accordance with the Federal Trade Commission 16 CFR, Part 255 - Guides Concerning the use of endorsements and testimonials in advertising, you may check our Giveaway and Disclosure Page for additional information regarding Ascending Butterfly Disclosure. Beautiful. Both your outfit and the exhibits! Hahaha. That's so cool! Everyone probably though you were the most artistic minded person there. What a beautiful place to visit! I'd love to go and I'm putting it on my bucket list. I love all of his artwork! He is so creative. I have a few of his art works at our tentacle garden it is probably one of my favorite things to see. I have been a fan of his work for YEARS. He is so talented!! I love it when your fashion screams "I came prepared" especially when it's not something that you planned ahead of time. Those are definitely the best moments. If I were in town, I would love to visit the Dale Chihuly Exhibit at the New York Botanical Gardens. I love his work. So colorful! I have always loved Chihuly. How cool that you accidentally matched one of the exhibits! What a cool place! I would love to visit here! Your outfit is awesome I love the colors and I think it is perfect you matched the exhibit! I love that it floats freely so it will never look the same. What an amazing art exhibit! I would love to see the New York Botanical Gardens. I think your outfit looks great. You blended right in. What a lovely exhibit. Those spheres are really pretty in the photos, but I bet they look even more magical in person. Your outfit rocks too! 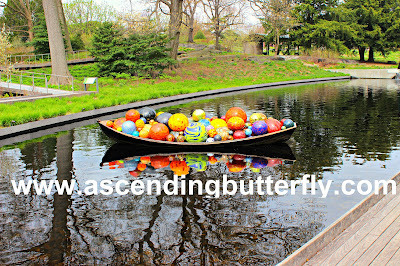 I would have LOVED to have visited the New York Botanical Gardens when I was there but we totally ran out of time (there is SO much to see!) I think I may have to go back like ASAP! I love going to exhibits. I like this artist's artwork. I wish I lived closer, so I can visit. Sounds like such a fun outing. Love that you ended up matching the exhibit. You brighten up a gloomy day with all that color. I think it's okay to match sometimes, well, you didn't really mean for it to be that way. I like your outfit though. It would be nice to go here and just enjoy all the artwork. I love that they're giving veterans free entrance. First, I love orange color! Such a vibrant color that easily gets me to the right mood. Would love to visit this exhibit too! I think you look beautiful though! It's not completely matching and I really like your outfit! What a great artist he is! If I am ever in the area on those dates, I'd love to see this exhibit. Oh, and your top matching some of the exhibits was cool, although I know you did not intend to do so. Glad that you were a good sport. I love it! I was actually cute that your top matched some of the artwork. I am happy that you were able to find humor in the situation. I would love to visit the exhibit too. Hopefully I would be in the area at that time. hahaha That is way too funny. At the same time, it made for a great photo. Niijima Floats is so amazing! That is so colorful.I like the butterfly picks also. Those are cute and creative. Such a great ideas! I like going exhibits. It is very interesting to visit there, because we learn and we see the some tools used with our inherited parents! Love that jacket! It's bright and colorful, just like the art! Great post! I'm loving ALL of the bright colors! My kids would love this art exhibit because it combines two of their favorite things---balls and water! I just love your outfit! I think it is so cool that your outfit matches the art. How cool! Just means you have a great eye for color and composition! That is hilarious. I love when stuff like this happens. That orange is a great color. Thats too funny. You look great and so does the matching art piece!